On the other hand, we were invited for the premiere of National Treasure at Sathyam Cinemas on Thursday. It was very Red Carpet, cameras clicking and all that and rubbing shoulders with the Biggies in the field and all. I loved the movie and though there were a few instances were I thought the way the actors reacted was kinda artificial, I am already waiting for the next one. Also I see that there are a lot of movies that are running which I'd love to catch up on. Time to grab the popcorn. One more line "You look great on that white tops" ;) "just kiddding dont take it to heart !! " Chinmayi, you look more cute in this photos with your short hair & Dress. yup vijey white suits me..
you are great i just listened to your guru song tere bina and went on a high asking myself what iam doing on this earth? 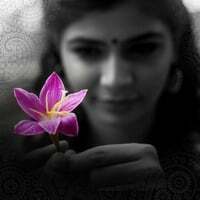 Chinmayi, recent song Adiyae En Vannakili is suprb. Also Malyalam, Telugu songs are good too, i don't know the language, but i like your voice on those songs.. chinmayi why don't you transfer some of your music talent to us. keep it up. Chimayyi, make up vara vara kooditte pokuthu :? aruthi: I enjoyed recording that song too.. this is prolly my first tamil duet with Vijay Y.
anonymous: I like that one! Ojade: Dont you think thats too much ?? :D Konjam over as they say! Anonymous: Illave illa... there is only Kajal and lip gloss.. Idhu romba koodudho?? Aiyo, Aiyo. There is tamil slang for this..
இப்படி உசுப்பேத்தி உசுப்பேத்திதான்டா ஒடம்பு ரணகளமா ஆகிப்போச்சு"
Btw, Chin, its just for Fun. I am telling this for years, concentrate on your Lipstick colors.. Very well trimmed..can you recommend some place who did a good job one you..as I'll be visiting India shortly for a wedding and need to get hold of a good parlour. Ila: suggest the shades lady! I would gladly use help. hey chinnu!!! !white tops n long skirt!!! !just awesome!! !so cute u look!!! Came across your blog when searching for songs. Is that you in the pictures? You look very nice.It's unusual but amazing that a singer blogssss! I like your songs very much. Well, after breaking at ur blog only, i got to know you a lot. Good good. Keep the work up. And one qs, whos that standing next to you in the picture?